RBTH presents a selection of views from leading Russian media, analysing the decision by Russia’s Federation Council to annul its resolution permitting the deployment of Russian armed forces in Ukraine, and proposed changes to the draft of the new Ukrainian Constitution submitted by Ukrainian President Petro Poroshenko. The newspaper Kommersant writes that the Russian Federation Council has canceled its own resolution giving the president permission to use Russia’s armed forces in Ukraine. This proposal was made to the Federation Council “for the purpose of normalizing the environment and settling the situation in Ukraine’s eastern regions and in connection with the recently initiated trilateral negotiations on this issue,” the newspaper reports. The original March 1 resolution “was protective and preventive and was not aimed against anyone,” Kommersant writes. “It is no coincidence that on the day of its adoption, the president said he hoped the right granted to him would not be used,” the newspaper continues. At the time that the resolution was adopted, the Russian authorities were facing the challenge of “cautioning the hotheads in Kiev against aggressive actions in Crimea and in south-eastern Ukraine,” Kommersant reports. The decision “fulfilled its historical role and notably strengthened Russia’s authority in Asia, Africa, and Latin America,” because it had not so much a military as a politically preventive significance, the newspaper writes. Russia “has confirmed its status as a great power by forcing its partners to reckon with it,” Kommersant says. According to the newspaper, those who believe the president’s latest decision to be a sign of weakness are deliberately “distorting the constructive direction of his proposals.” In Kommersant’s opinion, Russia’s western partners will perceive Putin’s decision as a positive signal. 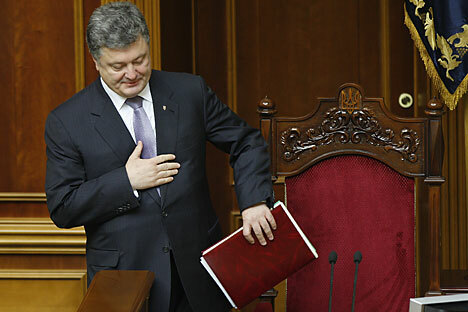 In another article, Kommersant reports on draft changes to the Ukrainian Constitution, which President Petro Poroshenko is planning to submit to the parliament. According to the newspaper, the changes mostly deal with decentralizing authority and increasing regional autonomy. Governors will be elected locally and not appointed from Kiev. Furthermore, the powers of local communities and councils will be expanded, and matters of language will fall to communities to decide. The status of the Russian language will not change, Kommersant reports: “Ukrainian was, is, and will be the only state, constitutional language.” However, Russian and the languages of national minorities will be used on a par with Ukrainian in the regions, Kommersant writes. Local administrations will be liquidated, and government representative offices will be created instead to monitor constitutional compliance and coordinate the activities of territorial bodies of executive power. Meanwhile, presidential powers will be significantly curtailed; the president will be stripped of the right to appoint judges and nominate foreign and defense minister candidates to the parliament, Kommersant reports. The government will be formed at the suggestion of the prime minister and with the parliament’s approval, but the Cabinet of Ministers will continue to be accountable to the president. The prime minister will be appointed with presidential approval but must be nominated by a majority coalition of parliament members. According to Kommersant, the new draft of the constitution practically makes the parliament “immortal,” because the president will be able to dissolve it in only one case – if the Rada is unable to form a government in a 60-day period. “All of Ukraine’s leaders have aspired to touch up the constitution in accordance with their own vision. Petro Poroshenko is agreeing to cut his powers because he doesn’t need the excess. In a complicated economic and political situation, he will place most of the arrows in the government’s quiver; besides, he can easily dismiss the government,” a Kommersant expert says, summing up the main thrust of the reform. Nezavisimaya Gazeta also reports that Ukrainian President Petro Poroshenko intends to submit a plan for new constitutional reform. In essence, the changes aim to decentralize authority and grant broad powers to the regions. According to the newspaper, this approach could be key to implementing Poroshenko’s peace plan. At the same time, Kiev admits that the first stage of the ceasefire failed, and the constitutional reforms that were planned during Yanukovych’s rule and initiated after the regime change resulted in backstage intrigues. Nezavisimaya Gazeta writes that the Verkhovna Rada commission that was supposed to present a draft of the new constitution to the public violated the deadline for writing the document and found itself mired in political dispute.